And Kaye, Lydia is so jealous of the crafts you’re going to receive. She did NOT understand why we were not going to keep this stuff for ourselves. I have to admit, I’m kinda jealous, too! I’ll be emailing you asap but if you see this first, email me your snail mail and I’ll get your prize right out. thanks again to bloggygiveaways for hosting all these fun giveaways! 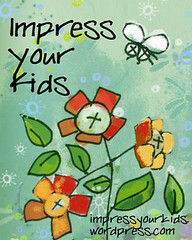 Welcome to Impress Your Kids! We are Amanda and Leigh, two sahms who just want their kids to think we are the coolest thing since TIVO. Actually, we’re just two moms who want to impress God’s Word on their kids. We try to do so by using crafts, stories, activities and anything else we can think of. And because we’re addicted to the internet, we blog about it. This is really a blog to keep us accountable to teaching our kids and to help each other be more creative. So, if you need some creative, crafty ideas, stick around and see what we’ve got going on! NOW. ONTO THE FREE STUFF!! 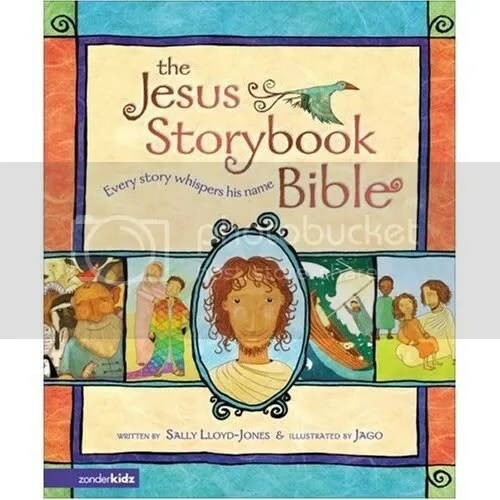 First, is The Jesus Storybook Bible by Sally Lloyd Jones. This is THE best Bible story book to help you plant God’s Word in your kiddo’s heart. Most kids’ Bibles are watered down cartoon versions of Bible Stories. NOT this book. Each story, humorously told and beautifully illustrated “whispers” Jesus’ name. (For more info, I wrote a big review of it here.) Believe me, you will LOVE this book. The second part of our giveaway is a BUCKET O’ CRAFTS (ok, it might not be a bucket…). That’s right, a big pile of the finest construction paper, pipe cleaners, pom poms and lots of other stuff you’ll need to have a crafty time with your kids (and hey, even do some of the crafts you see here on Impress Your Kids). Sound good? So to win the book AND the bucket o’ crafts all you need to do is leave a comment. It can be any comment (but comments that sound like you read our post and/or browsed our blog are especially appreciated!). If you subscribe to our feed, leave another comment and you’ll get a second entry. If you grab our little Impress Your Kids button (it’s the green one on the top of our sidebar) and post it somewhere on your blog you can get a third entry! Make sure you leave a valid email address and that you live in the US or Canada, too. We’ll announce our winner on Friday! Thanks to Bloggy Giveaways for hosting all these fun giveaways!